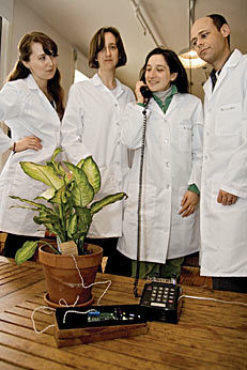 NYU grad students devise a way to nurture your favorite plants, long distance. Hartman and team started by inserting soil and moisture sensors into ten test plants, ranging from a scented geranium to a Rex begonia, and then linking them into a local network to monitor the level of moisture in each plant. Too much or too little H2O prompted a call in which the plants said such guilt-inducing things as, “I’m desperately in need of water. I feel horrible and probably look dehydrated.” Sometimes, though, they’d call just to say, “Thank you.” Harman says they decided to use the phone (as opposed to text or e-mail) because it’s the best way to build a bond. Indeed, each plant was given a voice in keeping with its particular species. For example, a fast-growing spider plant had a friendly, bubbly voice, while a cactus was made to sound, well, prickly. To learn more go to botanicalls.com.